John and Bob will be playing in the beautiful and intimate setting of Hove Methodist Church and we’d be grateful if you could pass this round your networks. Stay Up Late is a small local charity that promotes active social lives for people with learning disabilities focussing on trying to end social isolation for this often marginalised group of people. All funds raised will go towards our Gig Buddies project which enables people to go out to live music events with a volunteer buddy and build ongoing friendships with them. Although this is a new release, the material on this album was recorded some years ago at The Folk Studio, a now-defunct basement club in Rome. Renbourn didn't know he was being recorded and can't remember the date, though the evidence suggests it was during the late 80's. So if you want a taste of his long and restless career up to that point - both as a solo artist and as a headline member of various groups - there's plenty here to whet the appetite. The eight tracks lean towards instrumentals rather than songs, but perfectly balance self-penned originals and cover versions with arrangements of traditional pieces, together demonstrating his folk-baroque, country blues, classical and jazz influences. There's even a nod towards church music. Each piece is an easily-digestible live favourite in its own right, and the sum of the parts is a sweet cohesive whole. 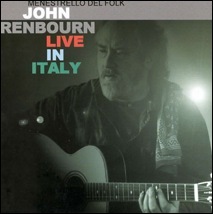 Renbourn uses five different tunings, but his banter with the audience has been edited out, leaving an intense 47-minute lesson in sheer guitar artistry. It's a testament to his awesome skill as a composer, arranger and performer that he can nurse such a consistently rich and smooth sound from one apparently simple instrument.